Home » Other topical issues » West Bench Elementary closure potential » Does the West Bench Elementary Subsidy Proposal lead to Two Tiers? Does the West Bench Elementary Subsidy Proposal lead to Two Tiers? The proposal you have made is not consistent with the spirit and intent of the School Act funding provisions which are aimed at providing equal access to educational programs for all […] Students in communities with the ability and willingness to contribute monies in addition to assessed school taxes would gain significant advantages over students in communities which could not provide these funds. There are two bad things and one good thing about this rebuttal. The first bad thing is that it is a classic slippery slope argument. It asserts that doom and disaster will inevitably follow without providing much evidence or support. Such arguments are lazy. Second, the board of SD53 worries that communities “with the ability and willingness to contribute monies…” will be able to buy superior access to schools. The word “willingness” is critical because it means the economic transaction is voluntary. I am no frothing-at-the-mouth economic libertarian but I do think something is wrong with a society in which citizens can use their own money to buy booze and smokes but cannot use the same money to keep their schools open. The simple reason these citizens are “willing” to pay more is that losing their school costs them more. Who is the Board of Education to tell people how they can spend their money? The good thing about SD53’s rebuttal is that, for all its flaws, it sounds right. Willingness to pay aside, the ability to pay is a sensitive subject, especially in a town like Osoyoos with more than its share of wealthy (if not quite full-time) residents. Canadians are generally uneasy about overtly linking our children’s basic education to wealth. I hear this objection all the time when discussing the West Bench proposal with neutral observers. I certainly understand this; many of us are against two-tier education in which richer communities have better schools and greater opportunities for their children whereas less-affluent communities must accept the much shabbier base model. So we are left with many questions about the West Bench Elementary proposal: Is it two-tier? How is the RDOS proposal to save West Bench Elementary different than the Town of Osoyoos proposal to save Osoyoos Secondary? How can anyone possibly hope for the West Bench proposal to succeed where the Osoyoos proposal failed? The basic issue is that the West Bench proposal fixes, rather than creates, an inequity. There are certain fixed costs to running a school (e.g., a principal) and it is much more efficient on a cost-per-pupil basis to run a high-enrollment urban school than a low-enrollment rural school. The Province of British Columbia recognizes that the economics are stacked against rural schools and provides additional funding to school boards so they don’t automatically close these schools when budgets get tight. We can call it a “subsidy”, although its real name is “small community supplement” (see here p. 9). Naramata and Kaleden elementary schools qualify under the province’s criteria for the full $157K small community supplement. According to information published by SD67, the supplement was sufficient to exempt these schools from the district’s school closure decision process. I am not saying excluding these schools is right or wrong, but it is what the Board of Education decided. This decision serves as the guiding precedent in the RDOS proposal. 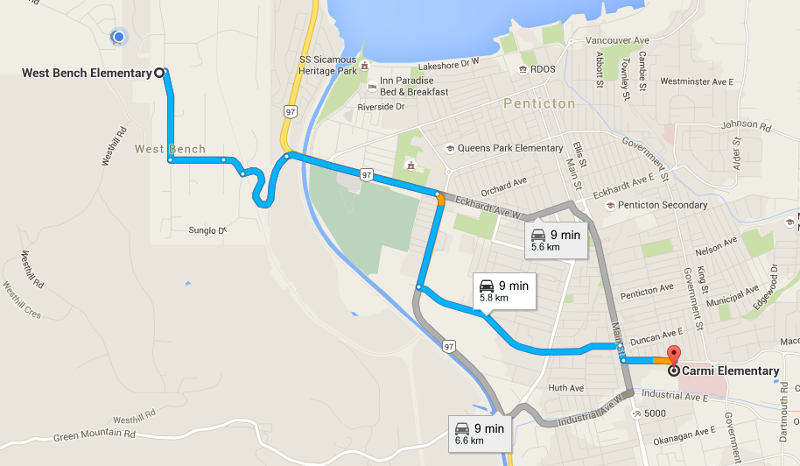 Be further than 5 km from the nearest elementary school by shortest road distance. Alas, according to Google Maps, West Bench is only 3.3 km from Queens Park. It is hard to argue with Google Maps, but for people on the West Bench—especially those who have walked this particular 3.3 km stretch—the 5 km threshold seems more than a bit arbitrary. After all, 5 km on a flat road doesn’t really compare to our 3.3 km hike over a river and up a series of steep hills. In short, not all kms are equal. We can forgive a map-reading bureaucrat in Victoria for thinking that West Bench to Queens Park is a reasonable walk for small legs. But we can draw on our local knowledge of the ground and recognize that no child is going to walk to Queens Park on a regular basis. And our 3.3 kms certainly fails the “two-way test”: No parent on the valley floor would tolerate a catchment map that sent their kid to West Bench Elementary. It is unthinkable. So here is the bottom line: Many on the West Bench believe that our neighborhood is a bona fide rural community despite what Google Maps says. The reasoning follows that West Bench should (a) receive a small community supplement from the Province of British Columbia and (b) should be exempt from school closure in exactly the same way as Naramata and Kaleden elementary schools were exempt. This is the fair outcome. Unfortunately lots of things should happen but few do happen. We have very little control over the map-reading bureaucrats in Victoria. And although we are committed to appealing the province’s narrow and arbitrary definition of a “small community”, this could take a long time. The stakes are too high to rely on the province to tweak a minor policy that only a small neighborhood at the top of a steep windy road cares about. At some point citizens (with the economic freedoms noted above) have to take matters into their own hands. Hence the proposal to raise a substitute version of the small community grant locally until the provincial issue can be resolved. Consider the middle school catchment map here. The closest middle school to the West Bench is obviously KVR. Yet kids from the West Bench are bussed all the way to Skaha Lake Middle School, which is easily the furthest middle school from the West Bench. And since kids from Skaha Lake Middle School end up at Princess Margaret Secondary, this is not just a two or three year inconvenience. West Bench kids spend a big part of their time in SD67 getting bussed across town for no obvious reason. I certainly despised this situation when I when I was in junior high and had to make the daily trek from West Bench to Maggie. I made sure my three kids enrolled in late immersion at KVR to avoid it. Consider the Board of Education’s more recent decision to close West Bench Elementary and ship all the kids to Carmi Elementary. Queen’s Park is clearly the closest elementary school. Indeed, as noted above, it is close enough to undermine the West Bench’s claim to a small community supplement. But yet SD67 believes it is okay to ignore the map and use West Bench kids to solve an enrollment problem in another catchment. Either the West Bench forms a contiguous whole with the schools on the valley floor or it does not. If the West Bench is part of a contiguous whole its residents should benefit from the same careful design of catchments as others in the district (recall all the fancy talk about “equal access”). If we are to take both maps and equality seriously, West Bench kids should attend Queens Park, not Carmi. And if SD67 deems Queen’s Park to be out of the question for West Bench kids, they should let the map-reading bureaucrats in Victoria know. Carmi Elementary School is 5.8 km away from West Bench Elementary. This makes West Bench eligible for the full $157K small community supplement from the province and we can forget about an RDOS subsidy. Instead what we are hearing is that Queen’s Park is good enough to sewer the West Bench subsidy but not good enough for any West Bench kids to actually attend. SD67 cannot believe that its age-old policy of bussing West Bench kids to the south end of town to solve enrollment problems is fair and legitimate unless it also believes that the West Bench is somehow separate and different from catchments on the valley floor. Otherwise, the discriminatory bussing should end. As an aside, this would have dire implications for enrollments at Skaha Lake Middle School and Maggie. West Bench elementary does not have many kids, but without them SLMS will be embarrassingly close to half-empty. But that is just an aside. So to summarize: What we are seeking in the RDOS proposal to subsidize West Bench Elementary is not an unequal two-tiered system. Rather, we are seeking the exact opposite. We are seeking an equal system in which all three rural schools in the district are funded at the same level and are treated the same by the Board of Education. There is no question that how we propose to achieve this level playing field is a bit unorthodox. But we really have no other alternative at this late stage. Whining and complaining about the fairness of the province’s arbitrary cut-off for small community supplements will not work, at least not immediately. Instead West Bench residents are offering to dig into their pockets to make two things clear to both SD67 and the Ministry of Education: (a) we believe West Bench Elementary is a rural school and (b) our community faces a substantial loss of viability if our school is closed. Let's not forget that by closing West Bench we are further strengthening the two-tier education system already in place -- the private school system. Rather than settle for such a poor option of being bused past the next closest elementary school, and put in a school that will be next to a construction site for the next three years, many WB parents are looking for a better, more equitable option. For next year, WB already has transfers to Outma, Holy Cross, Montessori and Entre-Lacs. By allowing this rural school grant, we will slow the flow of kids to the private school system -- to that second tier. From the late '70s to 2014, the percentage of students in private schools in BC has climbed from 4.3% to 14%. We need to make choices that make public school at least an equitable option, if not a preferable option for students. In addition, allowing another level of government, the RDOS, to provide money for the Rural School Grant is not the same as individuals paying for schooling in their area. (ie) it is separate and distinct from the private school tuition model or the local taxation model of the US. It is a level of gov't providing the subsidy. Allowing the RDOS to provide the Rural Grant money is as equitable as receiving this grant from the current providers, the provincial level of gov't. Great comments Michael and Heather. Is there anything residents can do st this point to help?